Jinger’s got that ‘blessing-making’ look in her eye! 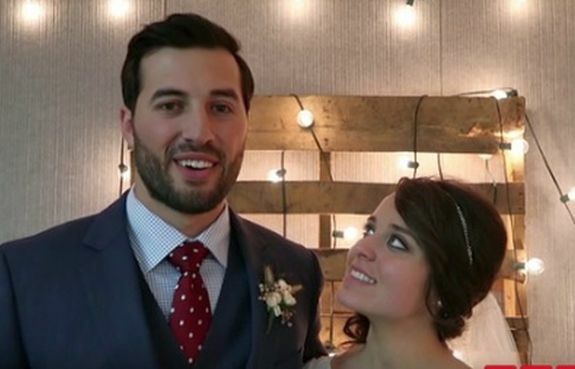 Jinger Duggar married Jeremy Vuolo last weekend (as you Roundupers know), but the Counting On star has just revealed some interesting wedding details to People magazine. Jinger, who is currently on her honeymoon with Jeremy getting some much-anticipated lovin’, told the magazine all about her nuptials, and revealed what it was like to have her very first kiss in front of 1,000+ people. “I wasn’t nervous at all,” Jinger said. Like her siblings Josh, Jessa and Jill before her, Jinger waited until her wedding day to have her very first kiss. She told People that she basically pounced on Jeremy as soon as they officially became husband and wife. People also had all of the wedding details, including info on Jinger’s dress and reception. Dress: Jinger said “I do” wearing a hand-beaded lace gown with a 13-foot train. She wore multi-colored high heels under her white gown. Wedding Party: Jinger’s 10 bridesmaids wore a sleeved lace gown in a variety of colors (including red, burgundy, brown, beige and lilac) instead of all of them wearing matching gowns. It appears that, for the first time in a Duggar wedding, 11-year-old Johannah Duggar was included as a bridemaid. She was pictured wearing the same bridesmaid gown as her older sisters Jill, Jana and Jessa, and sister-in-law Anna. Josh and Anna Duggar’s son, Michael, was the ring bearer. Reception: The decor for the couple’s wedding reception was done in olive, burnt orange and eggplant, according to People. Food: Wedding guests chowed down on meatballs, pickled okra, cheese and crackers, as well as a “naked” wedding cake (which is basically just a fancy way of saying “unfrosted”). Who Was There: Disgraced Duggar Josh made an appearance at the wedding, alongside his wife Anna. He was joined by his other 18 siblings. Who Wasn’t There: Surprisingly, Cousin Amy Duggar did not attend Jinger and Jeremy’s wedding. Her absence was surprising, since Amy is never one to miss a chance to be on-camera. Amy insists, though, that she only missed the wedding due to being in Las Vegas to attend the SEMA Show with her husband, Dillon. Token Creepy Duggar Family Quote: As always, one of the Duggar family members came through and delivered a strange quote in honor of the wedding festivities. This time around, it was Jinger’s mom, Michelle, who talked about how great Jinger is at doing what people tell her to do…or something. “They really balance each other out. Jeremy is a strong leader, and Jinger is such a gentle people person and a great follower,” Michelle told the magazine. The ‘Counting On’ episode featuring Jinger and Jeremy’s wedding will air next Tuesday on TLC. Want to see how their wedding compares to the other Duggar weddings? Click here! Check out the video below to see some snapshots from the wedding! Well someone cough cough TLC or People Magazine footed the bill for this wedding. Since she didn’t have to settle for bug eyed Sierra to plan it. Her wedding based on the pics looked more high end than her sisters. Jeremy did make decent money playing soccer and I think he comes from money so they could afford a nicer wedding. I loved the dresses and Anna looked really nice in her dress. I liked the red heels she wore I was surprised that they were allowed they weren’t too sinful. She looks genuinely happy. I am not surprised that her mom referred to her as a follower. Way to go raising strong independent women. She was the one I was thinking would stray away from the cult. I thought all the girls and Jinger looked so pretty. Too bad they have to ruin it by “transferring authority” and being a good “follower”. You can tell Sierra didn’t plan this wedding because it wasn’t a parking lot hoedown. It all looked pretty nice. Ive never watched not one episode only know that most of them have probably been molested by that pervball Josh. I actually feel very bad those girls were exposed to him for so long with the parents knowing what was going on. Shame on them!! All that being said, I do not believe that was her first kiss. This side hugging crap is so fos….they were probably doing a lot more than that. Not that there is anything wrong with that….I guess that’s their claim to fame. Excuse me for a second I want to side hug my fiancé…. “They really balance each other out. Jeremy is a strong leader, and Jinger is such a gentle people person and a great follower.” VOMIT. I hope Jinger RUNS from her horrible family. The Ashley ! Can you please post to your website the “message from the newlyweds” video off of the jingerandjeremy.com website, about half way in, Jinger turns to Jeremy to give that mandatory Duggar wife glaze of approval but you can notice the crazy dreadlocks on the back of her head that just makes this TOO funny knowing they’re just busy boinking the whole time… Enjoy! OMG you are so right it is so obvious!!!!! LOL!!!! Johanna was a bridesmaid in Jill’s wedding. Is that literally just a pallet with string lights thrown over it? ? Sienna (Cierra? Idk) is running out of ideas, apparently.